Ask toolbar is promoted via other free programs and once installed on your computer, they will hijack your browser homepage and replace your default search engine. 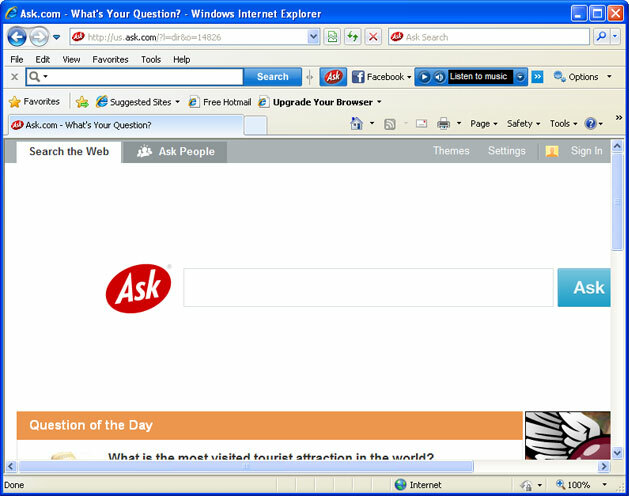 Sometimes you may find Ask toolbar in your Internet Explorer without you knowing when you installed it. In this article, I will show you how to remove it completely from your IE You may see more than a lot of articles on how to remove Ask toolbar on the internet, but in this one, I am gonna tell you the easiest fix. First you should download Wise Program Uninstaller(http://wisecleaner.com/wiseuninstallerfree.html), a function formidable program uninstaller. 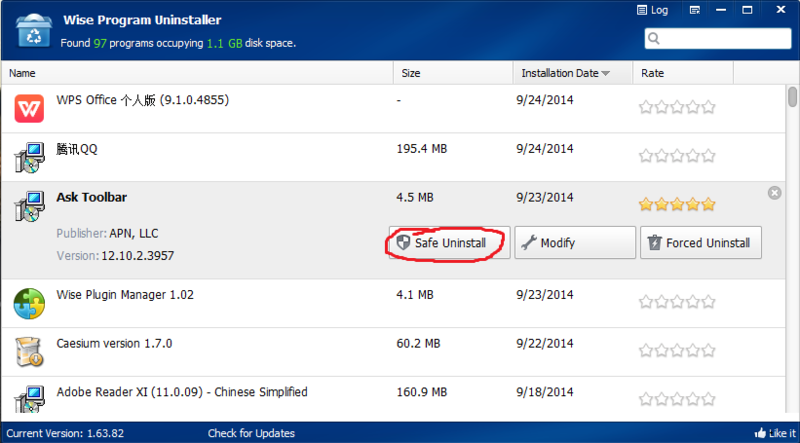 Someone may wanna ask, we can uninstall a software in Control Panel, why bother downloading a third party uninstaller. One thing you might not know is the uninstaller built in a software can’t remove a software completely, it might leave behind some residual files, folders or registry. Accumulation of this kind of junk files or registry could lead to a slow computer or even computer crash. 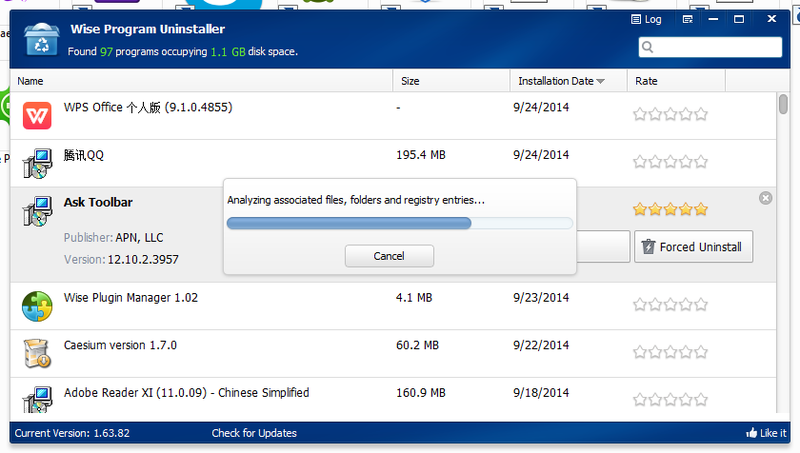 After downloading Wise Program Uninstaller, find Ask toolbar in the list. Of course if you have a lot of programs, you can just quick search it. When you find it, single click it, you will see a key called Safe Uninstall, single click it, it will automatically execute the built-in uninstaller of Ask toolbar. When this process is finished, Wise Program Uninstaller will analyze all the associated files, folders and registry entries, and present you a list of the analyzing result. You can just click Remove to erase all these useless files. Then you will find the toolbar is already gone from your IE browser. How do I change Ask.com default home page or search engine in Internet Explorer? Internet Explorer allows you to change your browser home page at any time. In the upper right corner of your Internet Explorer browser window, select the gear icon (as shown below), and then "Internet Options" from the drop down menu. If you cannot find the gear icon, find the row of menus across the top of your computer screen such as File, Edit, View, etc. Click on the menu that says Tools, and from that Tools menu, click on Internet Options. Then proceed to the next step. Find the section marked "Home page." When you first open Internet Options, the entire home page address should be highlighted in light blue; type the backspace key on your keyboard to delete it. Alternately, use your mouse to select the entire address you see beginning with "http://www.search.ask.com" and delete it with the backspace key. Then, type your desired home page in that space--for example, if you'd like Yahoo as your homepage, type in www.yahoo.com. Once you have typed in your preferred homepage, click "Apply" and then click "OK."
That's it for your default homepage settings! 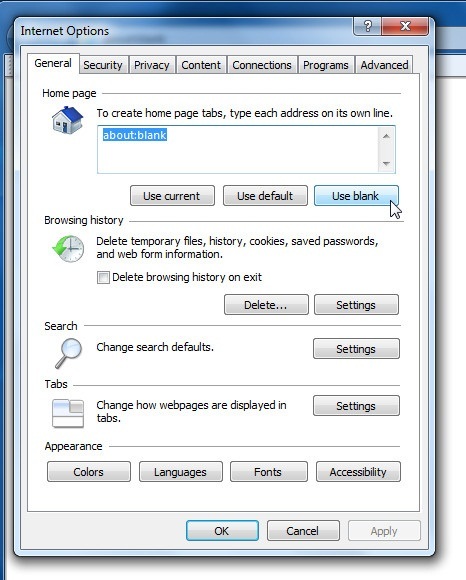 After making the change to your default homepage, you'll need to open a new Internet Explorer window to see the change. Changing your homepage setting doesn't retroactively affect pages you already had open prior to making the change. I want to keep the toolbar but remove the ‘Brower Helper’ as it’s described in manage add-ons. But, I try to disable it but it disables the toolbar also. How can separate them.